"Pristine deserves nothing but praise for what it has done"
The final instalment in Furtwängler's superb Italian Radio Ring, Götterdämmerung offers for much of its duration perhaps the finest sound of the entire cycle. With each act being recorded on a different day, one notices slight changes in quality, and for me the best of the lot technically, from Das Rheingold onwards, is to be found in the second act here. 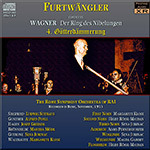 From a musical point of view it is also interesting to assess how Furtwängler and the Italian orchestra increasingly gel through the performances, and listening to Götterdämmerung leaves little doubt that by this point all the musicians, soloists and conductor were performing with a single, unified vision and purpose. However, this does not mean to say that Götterdämmerung didn't through up a whole heap of technical difficulties to be addressed. As with all the Ring operas I found hundreds upon hundreds of thumps, like someone stamping on a wooden stage. Götterdämmerung was no exception, though inexplicably not all of the acts in all of the operas suffered this, and here Act Two escaped. Tape hiss too was barely noticed during Act 2, though a major issue throughout Act 3 and here quite variable. Act 2 suffered other short noise problems which, although simple enough to deal with singly, involved again hundreds of individual, manual interventions and many hours of work. The greatest difficulty, though, was reserved for the final act of the entire Ring - extensive sections of repeated treble dropout at approximately quarter-second intervals, repairable only by hand-selecting each section and boosting it sufficiently to smooth it out - a hugely tedious and time-consuming task. Curiously I noticed the same problem afflicting the first 45 minutes or so of the EMI CD transfer of Act 1, yet it was happily absent from EMI's original 1972 LPs used here. Overall, the end result I hope more than justifies the time and effort spent in restoring it and remastering it. The transformation here with XR remastering has been quite amazing to hear and hugely rewarding - one embarks on lengthy projects such as this without any firm idea of how much success (or otherwise) one might be fortunate enough to witness. To paraphrase Furtwängler's words slightly, and echo them back to the conductor with perhaps some similar feelings after spending several weeks almost entirely immersed in Wagner, "I hope he would have been satisfied with me"! In the previous issue of Fanfare I reviewed the RAI Das Rheingold and Die Walküre from Pristine, and I noted that I have written extensively about the two Furtwängler Ring cycles in previous issues (20:2, 29:6, and 33:1). I said in that review that there are pluses and minuses to both the La Scala and RAI cycles, but that Pristine’s restoration work was so good as to possibly tilt the balance in favor of the RAI. These two releases only confirm that feeling. While the Scala cycle has the intensity of single, staged performances (this RAI cycle was broadcast one act per day, with days off in between, and unstaged), the superior sound quality of this cycle, having reached, in this incarnation, the level of a good monaural studio recording, is a serious factor in its favor. And while the Scala cycle has the great voice of Kirsten Flagstad (past her prime but still magnificent), this RAI cycle has singers who always sound fresh because of the rest between acts that they were given. And overall, the casting is superior here to the Scala. As we get to these two final operas in the cycle, it sounds as if the orchestra and Furtwängler had become more comfortable with each other, so the orchestral playing seems more free and natural than it did in the first operas. The conducting remains today what it has always been: a model of how to shape this music. Furtwängler thinks in paragraphs and chapters, not in sentences. He builds climaxes theatrically (listen to the transformation of “Dawn” in the Prologue to Götterdämmerung), but also always keeps the long view in mind—so as powerful as any moment along the way might be, it doesn’t outweigh what is yet to come. One of Furtwängler’s important skills that is often undervalued because of the cramped quality of many of his recordings is his ear for orchestral color, and Pristine’s transfer allows us to experience that more fully than ever before. The casting is as close to ideal as one might get in 1953. Martha Mödl in particular benefits from Pristine’s transfer. Her voice sounds a bit hard on the various EMI incarnations but seems freer and more open here. More important, though, than any individual performance is the sense of ensemble that one gets from these performances. One suspects that the rehearsal period was extensive and intense, and the result is a total immersion in the music and text, between singers among themselves and between singers and orchestra. This RAI Ring cycle remains one of the glories of the recorded musical history of the 20th century, and sounds here fuller, warmer, cleaner, and more natural than it ever has before. Pristine makes its transfers available as downloads and CDs, in monaural sound and in what they call “ambient stereo.” The latter is not the “reprocessed” (or fake) stereo of the 1960s and ’70s, but rather a monaural reprocessing that allows the illusion of space to the ambience surrounding the main signal. (There are probably better ways to explain this; I’ve never pretended to be an engineer.) Both versions sound better than previous transfers of these recordings, but I do find the ambient stereo version more natural and pleasing, particularly over the length of these scores. Notes are minimal, texts nonexistent, but it doesn’t matter. These are recordings for specialists who know this music, and Pristine deserves nothing but praise for what it has done in restoring them. This article originally appeared in Issue 35:2 (Nov/Dec 2011) of Fanfare Magazine.